H arpers Ferry and its surrounding areas were land originally belonging to the tribes of the Iroquois Nation. The area has produced Native American artifacts from as far back as the 12th century. Swiss immigrant Louis Michel reported Indians in the area during his 1706 travels along the banks of Potomac River. The land upon which Harpers Ferry sits was first settled in 1732 by Peter Stephens, an immigrant German trader. Stephens built a log cabin home near "the point" at the confluence of the Potomac and Shenandoah Rivers, gaining squatter's rights to the land. Because of the low elevation of the area, the property was quickly nicknamed "the hole" and "Peter's hole". In 1747, Robert Harper purchased Stephens squatter's rights. Harper, a Quaker colonist and an experienced millwright and builder, was passing through the hole on his way to construct a meeting house for fellow Quakers near present day Winchester. He recognized the strategic location of the area, and was attracted to the ample water supply from the rivers. On April 25, 1751, Harper secured a land patent for 125 acres in "the hole". By 1761, Harper had constructed a ferry to boat passengers back and forth across the Shenandoah River effectively making his small, unincorporated town a starting point for settlers traveling west. The ferry was named Harper's Ferry. As Harper's Ferry began attracting more travelers, Robert Harper petitioned for the small town surrounding his ferry to become incorporated by the Virginia General Assembly. The town was incorporated in 1763 as the town of "Shenandoah Falls at Mr. Harper's Ferry". 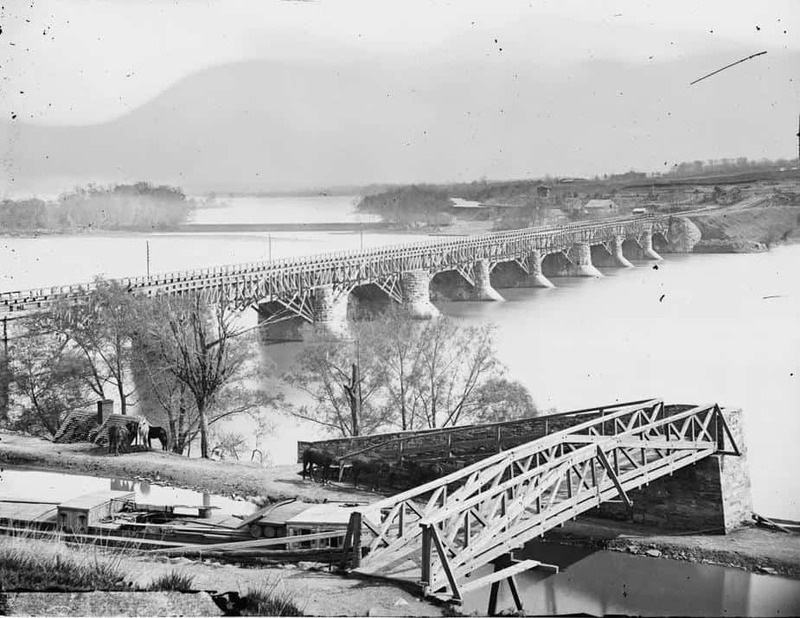 During the summer of 1785, George Washington, as president of the Patowmack Company, visited Harpers Ferry in order to determine if bypass canals were needed in the area. Washington also recognized the strategic position of the town, and in 1794 petitioned for the area to be the site of the southern U.S. Armory and Arsenal. The government purchased a 176 acre plot of land from the heirs of Robert Harper in 1796, although construction likely did not begin until around 1798, with the first firearms being produced in 1799. The armory and arsenal were key to supplying the Lewis & Clark Expedition with arms, parts, ammunition, and even technology, such as a collapsible boat, which ultimately failed due to a difference in timber. The 1830's saw a industry boom in Harpers Ferry and a flood of Irish and German immigrant workers. 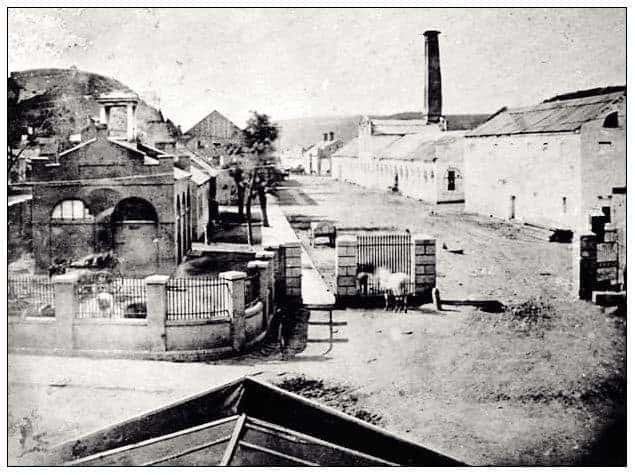 In 1833, the (C&O) Canal reached the town; in 1834, the Baltimore & Ohio (B&O) railroad arrived; in 1836, the Winchester and Potomac Railroad linked with the B&O railroad. 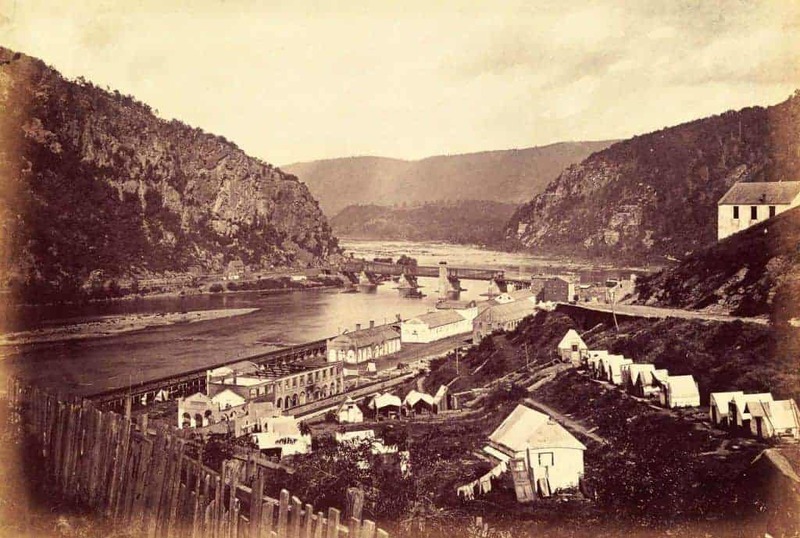 Harpers Ferry and the areas surrounding it are very rich in limestone, shale, and iron ore -- quarry, mining, and transportation industries were quickly climbing in the area.